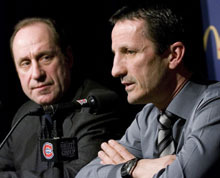 In an interview with the Quebec English newspaper The Suburb, just published, Carbo had this to say about his former friend and linemate and former Habs GM Bob Gainey: "No I do not talk to him. I still think that if we were good friends he would have told me the truth when he fired me. I still do not understand what happened. Whenever I am around him now, it is very awkward. I am not a kid anymore. I could have handled the truth."